Fuxoft's Blog: Czech legal system = 0wn3d! Have a look at this man. If you see him somewhere, inform the police. He is a fugitive. His tale is really cool story about either total incompetency or total corruption of Czech legal system. 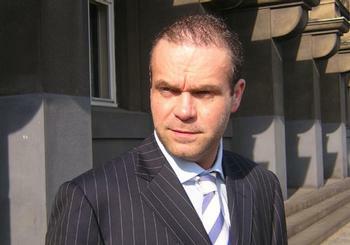 His name is Radovan Krejcir. He is a suspect in several fraud cases worth several millions (U.S. dollars!) and tax evasion worth 20 millions (also USD). He was already jailed once and secret room was found in his house, containing ilegally owned firearms and documents about his crimes. However, Krejcir had to be released, because he was sitting in the jail for 12 months without the state charging him with anything (apparently, they wanted to, but 12 months wasn't enough to prepare the required documents)! Yesterday night, he was arrested again by SWAT unit (with big guns, stun grenades etc). Today, his home was searched (with him present) and during the search - and now I quote the police - "Krejcir took advantage of the complexity of his mansion and disappeared". Wow, magic! Mr. Krejcir seems to have been inspired by a paranoic taxi driver (Mel Gibson) in Conspiracy Theory.